Perth is a large community facing prison receiving offenders predominantly from courts in Perth and Kinross, Dundee, Angus and Fife. The current design capacity is over 630 and we hold on average 678 prisoners per day. The prison manages adult male offenders on remand, short term offenders (serving less than 4 years), long term offenders (serving 4 years or more), life sentence offenders, sexual offenders and extended sentence offenders (Order of Long Restrictions). Perth was built on land purchased from the Moncrieff family, under the direction of Robert Reid (1774-1856) between 1810 and 1812 by French Napoleonic Prisoners of War. During that time it was used as a depot for some 7000 offenders from the War. During their captivity in Perth Depot they were relatively well treated. The offenders would make dolls from straw and carve beautiful ornaments from animal bones which sell to the people of Perth at a market held every Wednesday at the Depot. French Officers were usually 'paroled' into the City and would stay with local families. They had to sign a promise that they would not try to run away, indeed, the few that did escape back to France were sent back by their own side to ensure that the conditions of parole were maintained on both sides of the Channel. All of the French prisoners were repatriated after the Battle of Waterloo on 1815 and thousands of Perth people turned out to wave them off! Between 1815 and 1839 the depot was used as a military store for uniforms and weapons. In 1839 it was decided to build a central civilian prison on the site of the Perth Depot. The first phase, C Hall, was completed in 1840 and became The General Prison at Perth. It is the oldest occupied prison in Scotland. In 1870 the prison had the dubious distinction of being the site of Britain’s first private (or non public) execution when George Chalmers, a vagrant from Braco, was hanged within its walls after public executions were abolished in 1868. The General Prison gained further notoriety around 1914 as the only prison with the facilities to force feed hunger striking suffragettes. The prison was partially closed between the years 1922 & 1927 when it was used solely as a reception for adult males before they were sent "up the river" to Dundee Prison. Perth fully reopened after Dundee prison closed in 1927. The prison’s B Hall was demolished in 1948 after a major fire and later the cookhouse was built on the site. The central tower was removed c1965. A new purpose built execution shed was completed in 1965. Known as the Hanging Block, it was never used as the Murder Act 1965 abolished Capital Punishment for the crime of murder. It was subsequently used as offices and a training facility until it’s demolition in 2006. There was very little refurbishment or improvement made to the prison until 1996 when 'D' hall was closed for a complete upgrade. From 1996 the prison was in a constant state of upgrade. 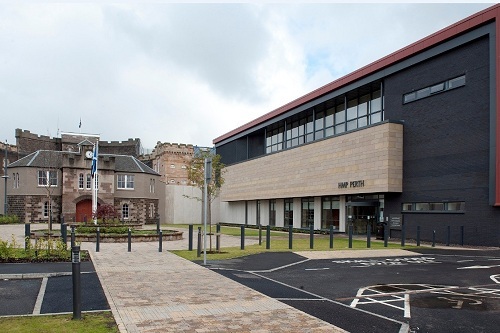 The most recent refurbishment was carried out in three stages over five years and was completed in 2007 making HMP Perth a modern, fit for purpose facility. Family Contact Officer 01738 637 198 (FCO - The phone is not staffed at all times during the day, but there is an answer machine service so please leave your name and contact details and we will get back to you as soon as possible). · Take the M8, at junction 13 take the M80 then merge onto the M9. · At the Keir roundabout take 2nd exit onto the A9, At the Broxden roundabout take 2nd exit to A93. · Follow the A989 Leonard Street onto Kings Place. · Turn right onto the A912 Edinburgh Road follow signs to Perth Prison (opposite Jet Garage). · Turn left onto the A989 then onto A93. · Turn left back onto the A912 Edinburgh Road. · Follow signs to Perth Prison (opposite Jet Garage). · At Dudhope Roundabout take 2nd exit onto the A923 then onto the A90. · Carry onto the A85 then turn left onto A93 then left again onto A989 follow onto A912. Edinburgh Road follow signs to Perth Prison (opposite Jet Garage). · All Routes Head to the Forth Road Bridge. · Take M90 up to junction 10 onto A912 Edinburgh Road. The bus station is situated approximately 50 yards away on the opposite side of the road from the railway station. Turn left when leaving the bus station and walk along the road until you see the railway station then follow the directions by Rail below. Perth Prison is a 10 minute walk from the railway station, a taxi service is also available. From the railway station turn right and go under the bridge, walk about 150 yards until you come to the South Inch (a large park area on the right of Marshall Place) You can cross the park diagonally until you come to Edinburgh Road opposite the prison, or follow the road down to the traffic lights, turn right and carry on up Edinburgh Road to reach the prison. On entering from the main road, turn left for the visitors’ main parking. For disabled parking, turn left into the main car park, carry on round the one-way system, the bays are at the front of the prison. Convicted offenders and those on remand book their own visits and have the responsibility to inform their visitors of the day and time of the visit. Remand prisoners may have one visit daily, except Sundays – no visits are facilitated on this day. . Maximum of 3 adult visitors, this does not include children (under the age of 16). Visitors please note that hooded tops are prohibited. Agents visits can be arranged on 01738 458 166. A maximum of three offenders can been seen in any one session, each session lasting 45 minutes. A maximum of four offenders can be booked on any one day. Only 4 appointments can be booked at any one time. A minimum of 24 hours and a maximum of 4 weeks notice is required for booking agents visits. Agents are not allowed to change the details of their bookings, and they are not allowed to cancel and re-book the session within a period of 24 hours. Evening agents visits can be arranged for Monday to Friday and these will be held in the agents room within the open visits room. These sessions will be from 19:00-20:00. Only one agents visit can be booked for these times. Weekend visits can be arranged for Saturday at 14:15-14:45 and these will be will be held in the agents room in the open visits room. Only one agents visit can be booked for this time. You are required to carry your Law Society of Scotland ID card. To gain access to the prison for the purpose of visiting, you must have two forms of identification, one of which must be photographic ID. Entry to the prison will not be permitted without acceptable identification. On entering the prison through the main door you will be required to present your identification to staff. Staff will log you in on the system and you can then use the facilities and relax until your visit session is called. You will require your identification and any money you are handing in for the offenders PPC. Lockers are available for any belongings not permitted in the prison. You will need a £1 coin to operate the locker which is refundable. You will not be allowed to take in a purse and wallet. If you have a baby with you, you can take essentials such as a change of nappy, baby wipes and plastic bottle with milk - no baby food is permitted. The baby items must be left on the FCO's desk in the visit room, but you can access them when you need to. Prams and buggies are not permitted into the visit room and can be parked by the lockers. The only items allowed into the visits room are the locker key and change for the vending machines. Toilet facilities are available in the centre. You will then walk through a metal turn-style into a secure waiting area. There will be staff in this area to help and offer guidance. In the waiting area you are able to deposit money in for prisoners PPC. All visitors will be asked to walk through a metal detector and given a rub down search by a member of staff. At times, there may be the SPS Dog Unit operating at the visits - it's nothing to worry about and you will be given instructions by the staff. If you have any concerns at all - please talk to a member of staff. You will be taken down to the visits room where you can find information leaflets and a variety of magazines to browse through. There is also a soft play area available for younger children in the waiting area, and there are toys available in the visit room. We endeavour to have a FCO available between the hours of 8:30 and 20:00. They are on hand to answer any queries or concerns you may have in relation to maintaining contact with family members in prison. The FCO contact number is 01738 637198. This number comes with a voicemail service so if you cannot get through please leave your name and contact number and a FCO will get back to you as soon as possible. If you require to speak to an FCO in the prison ask an officer who will arrange for one to see you. Once visitors are seated the prisoners will then be brought in. You will be made aware 5 minutes prior to the end of the session. At the end of the session prisoners will leave first and then visitors will be asked to exit. If you make your way to the visits support and advice centre Crossreach staff and volunteers are on hand to offer free refreshments and information in a neutral setting. The aim of the centre is is to maintain communications in the family unit, to increase self-esteem, reduce social isolation and motivate and encourage visitors. The centre has close links with family contact officers in the prison. Alternatively you can phone 01738 625503. Offenders will complete the relevant form (pro forma) with the date and time property will be handed in. It is the offender's responsibility to inform their visitors what they can hand in and when. Visitors handing in property require photographic identification and evidence of their home address, as described for visiting identification. Staff will issue a receipt for the property. You can post in property for offenders, but the offender must have completed the pro-forma prior to the items arriving. Mark the parcel for the individual's attention. To ensure the parcel arrives safely, you can send it recorded delivery (cost incurred at the post office). You can post money or cheque into a prisoner for their PPC, however we would strongly recommend either recording/special delivery (cost incurred at the post office) when posting cash or you can post a cheque or postal order (again there is a cost incurred at the post office for the order) in. Both of these should be made payable to the Scottish Prison Service, but please add the offenders details on the back of the order or cheque.